Do you love robots? Do you love destruction? Are you tired of the same old robot competitions? We've got just the thing for you: the SparkFun Antimov competition! Based on Isaac Asimov's Three Laws of Robotics, the Antimov competition challenges you to design a robot which breaks the laws of robotics (well, except for hurting humans of course). A robot is traditionally designed to perform a complex task as efficiently as possible. Building a competent and efficient robot that completes its task unharmed is SO last year. We want you to build a robot that completes a trivial task in the most inefficient and laborious way possible. Oh yeah, it needs to destroy itself doing so. Intrigued? We thought so! We ultimately wanted a competition that focuses less on engineering abilities and more on creative ingenuity. Robot must be autonomous. The only external control is a required kill switch, which can be wired, but if so must prove to not be a control mechanism. Robot must complete at least one task performed upon an object external to itself. Robot must destroy itself after the completion of the task in rule 2. Robot may use any prop, structure, or external device that can be placed in and removed from the exposition area. It can also use any of the existing features in the exposition area. Robot cannot violate Asimov's first law. i.e. no hurting humans, and must have a reliable kill switch if something goes more wrong than intended. Robots will be given three chances to complete their performance. If at any point during the performance the designer wishes to stop the robot, she/he can do so without penalty, up until the third run. **Scoring: **Scoring will be based on a set four criteria, listed below. Each category is 25 points for a possible total of 100 points. Inefficiency (0-25 points) - the inefficiency of the initial task. The more complicated and inefficient, the higher the score. Pointlessness (0-25 points) - the pointlessness of the performed task. The more trivial the task, the higher the score. Drama (0-25) points) - the dramatic element to the robot's self-destruction. The more poetic, creative, and dramatic the death, the higher the score. Destruction (0-25 points) - the completeness the robot's self-destruction. The more in-operable and devastated the robot is at the end of its performance, the higher the score. Prohibited Items: This is a partial list only. Each applicant will be required to send in a project proposal for review by a third party safety panel. Don't worry, the day-of judges will have no prior knowledge of your performance. If the delivered project is not as safe or safer than the proposed project the competitor will be disqualified. SparkFun reserves the right to prohibit any item or items it feels will compromise the safety of the competition, its participants, or spectators. The video winner will be announced at the live competition on October 16th, 2010. Your video must have an introduction and explanation of your entry, as in some info on you, what we'll see and how it works. It also has to be continuous, which is to say no editing for dramatic affect. Remember - the device has to be autonomous and we'd like to see it so in the video. We want to judge the actual event, not the editing skills of the entrant. Also, since the performance occurs on your own turf, the forbidden items list becomes somewhat obscure, so we're going to trust your judgment here (famous last words). Don't kill anyone or any animals, don't create any environmental hazards, try not to get the cops called, etc. 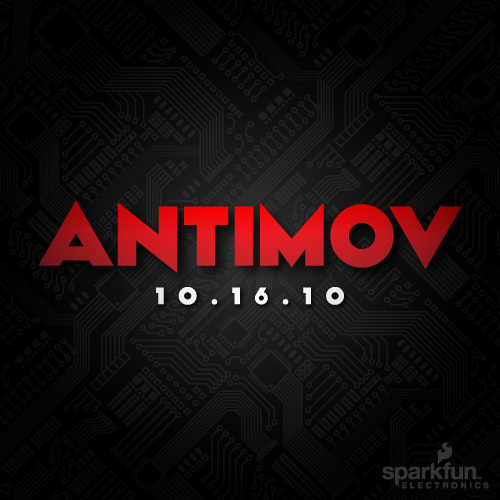 Please submit entries to antimov@sparkfun.com. **Prizes: **Of course you only do this for the glory, but a bit of foldin' money is good too. Here is how prizes will be awarded. Minimum $1000 cash prize for the winning live performance day of the competition. With each entry, we'll add $100 dollars to the pot, meaning if all 25 entries are claimed, the prize will be $3500. Minimum $500 cash prize for the winning video entry. With each video entry, we'll add $50 to the pot, with a cap of $2500 (40 entrants). After 40 entrants, videos will still be accepted, but the prize will not go up further. Okay, so we’re gonna be honest - you’re pretty good-looking. And there’s a chance, ever so slight, that we are going to want to use your likeness to show how beautiful people like SparkFun. For that reason, please don’t get mad at us if, five years down the line, there is a video on our website of you being chased by a burning robot. Because, a) like we said, you’re good-looking, and b) your face was probably pretty priceless as you dove into the pond trying to escape. We also might take some pictures and videos of you or your robot (if you bring one). We might even use these on our website or in an advertisement, or take out space in Times Square with a 500-foot tall image of your face (though not too likely). But by coming onto the SparkFun premises today, you understand all of the above things could happen, and you’re agreeing to keep your cool if it does. By coming onto SparkFun premises during this event, you acknowledge that you are a death-defying, fun-loving, thrill-seeking electronics enthusiast that may or may not leave unharmed. We like you, but we can't be responsible if you somehow get hurt. You also understand there are awesome/potentially dangerous robots acting around under their own control. At any given time, these bots may end up charging full-speed in your direction. There is also a chance the machines will group together, à la Terminator, and rise against us – but we really hope not. Either way, we're not really sure what's going to go down, so don't say we didn't warn you. Basically, anything can happen – so be prepared and have an awesome time! May the best team win! Win. Can't wait to see this! The Antimov contest is intended to go against the typical robot contest where a single robot fights a problem, wins, and survives. Instead, a single robot fails and self-destructs. That's not quite the opposite: how about multiple robots that get in each others' way, fail and self-destruct (think Keystone Kops). For example, consider a group of cardboard-box fire-fighting robots, each equipped with an aerosol hair-spray can, gathered around a lit candle. Individuals could provide more than one robot, or multiple contestants could join in a melee or "last man burning" round. I just had a mental image of Wall-E picking up an airbag, putting it in his little storage compartment, then setting it off. You sir, just made my day. please define "safety" and "bystanders". This message generated by the semantic analysis program of the smashinator-3000. 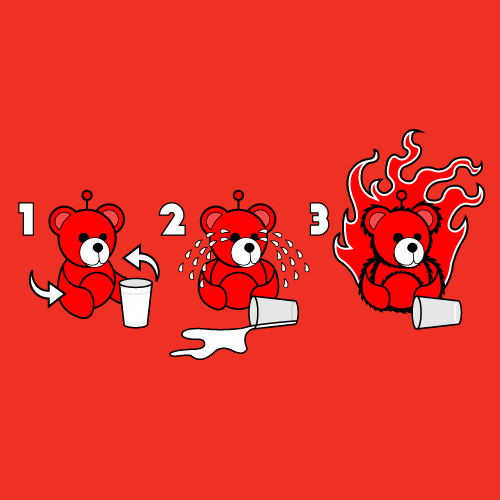 Ok, so when are the shirts with the second picture going on sale? WANT. I'm sad I can't make it to the competition... It should be enjoyable. Are there plans to hold this event again next year? This could be fun, but I don't quite understand the point other than humor. I'm not sure whether I want to design something that ends up destroying itself. Furby! I think a Furby might enjoy a dip into a pool of hot solder after trying to dip a pitiful looking pcb board. Oh, Furby could become a real star of this competition. Did Jonny Depp do this in the last Willie Wonka film? OO OO that give me an idea! Hee Hee Heee. What would you estimate the cost and amount of time for something like this? "Robots will be given three chances to complete their performance." This rule is not only ironic, but really inspiring! On the news page, it gives the example of the teddy bear failing to dunk the cookie, but the rules seem to say it should succeed, just as inefficiently as possible. It is supposed to succeed, correct? I guess you could define your goal as "fail to dunk cookie, spill milk", in which case the teddy bear example is correct. I won't be able to attend due to geographical and financial limitations, so really this is for the rest of you guys lol. And yes, we DEFINITELY need this to be videoed and put online, preferably the Sparkfun Youtube channel. In a world where there is an ever increasing flow of products chasing fewer and fewer dollars the idea of buying stuff and then (autonomously!) smashing it up is an idea on par with the finest ever produced by Adam Smith and the gang. I'm including this in my business plan right now. Is it possible to have an streamig in order to people form other countries (in my case from Spain, Europe) can see the event? Or, if not possible, at least a collection of videos in the web? What about the use of explosive bolts like they use on the space shuttle? No firecrackers or guns... Bummer. Are there restrictions on which power sources we can use? :D there are more than one ways to create an explosion. I think "Death By Pine Tree" has an unfair advantage. It destroyed it self at the end of the last competition.